The 2017 Global SharePoint Survey sponsored by Hyperfish, Sharegate and Nintex closed last month with over 450 respondents. 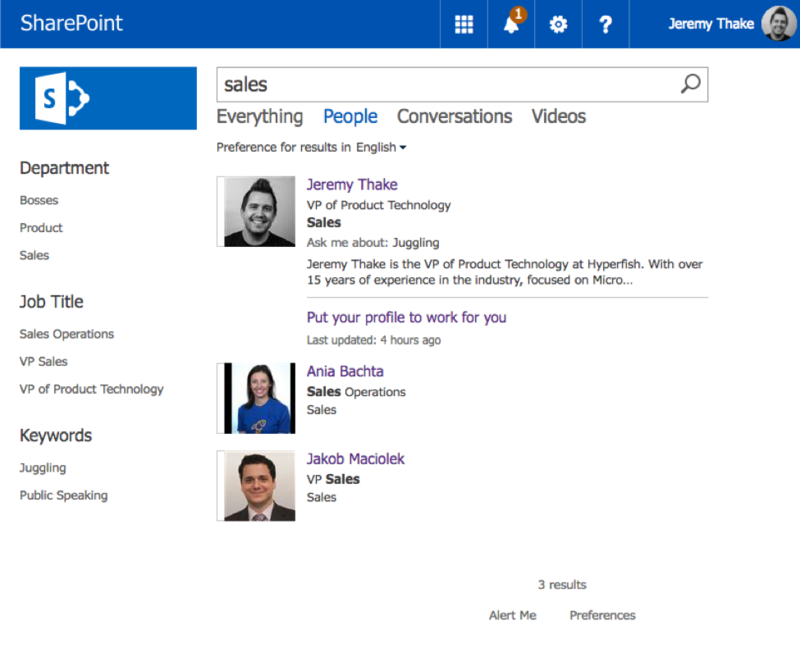 In this post, I’ve focused on my observations of the results from a people profile centric view and some tips to enhance your own productivity on Office 365. 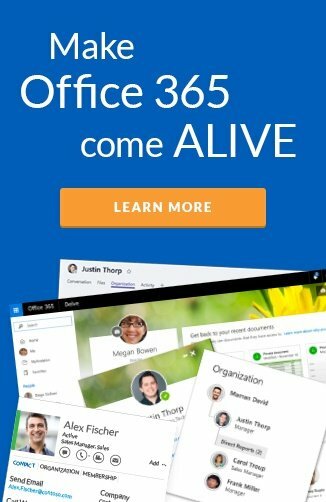 Office 365 is fast tracking! Every year we see that the move to the cloud is more prominent with 32% stating they are planning and 16% in the process of migrating. 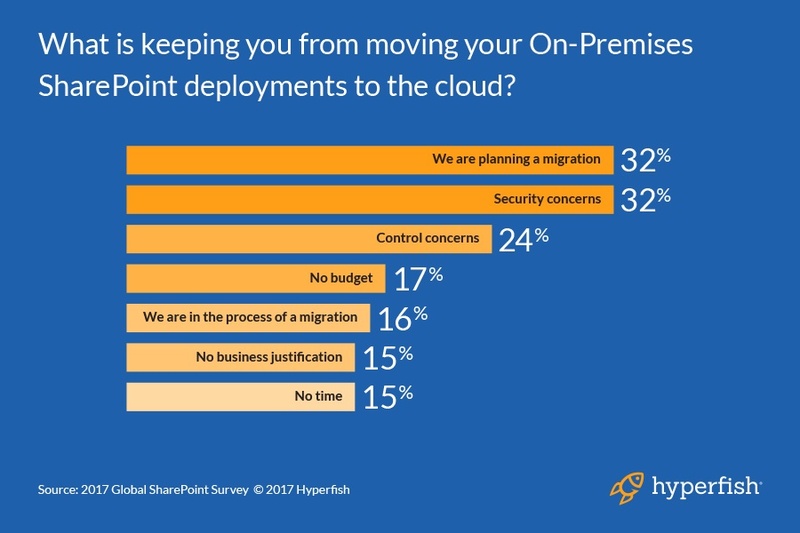 There are still concerns around security (32%) and control of the environment (24%) in Office 365 that are making organizations hesitant to make the leap from on-prem. The Office 365 maturity of customers seems to have moved passed getting Exchange mailboxes into the cloud and onto either lift and shift of SharePoint sites or starting net new SharePoint in the cloud. What is encouraging to see is Microsoft Teams already in use by 41% of respondents, this will be the Office 365 service to watch in 2018 for sure. The Ignite 2017 conference buzz around Microsoft Teams also showed evidence Teams usage will be high in organizations. Tip: If you have, or are considering Office 365, Microsoft Teams is a quick win to help make teams inside your organization more productive through chat, voice and video. 52% of respondents confirmed that are already using Office 365, but it is disappointing to see that only 33% of them are using Delve for people and document discovery. I’ve previously written about some organizations avoidance of this powerful service. As such, it is no surprise that the majority of Office 365 people search is done in the Outlook Global Address List (66%) and Skype for Business (50%) because users spend so much time in these services. 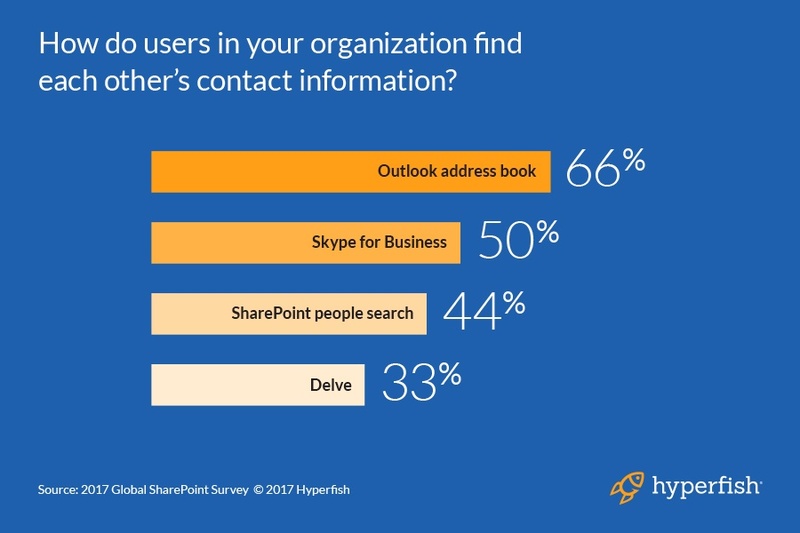 Nearly half of respondents (44%) are taking advantage of SharePoint’s Search Center people page that gives great faceted and advanced search features. Over 36% of organizations had their own Intranet Staff Directory rather than using out of the box experiences. Tip: Invest the time to surface people search directly on your Intranet homepage. The SharePoint Search Center is the best out-of-the-box people experience, because you get faceted searches and can customize what information is shown on the results page. It is worth investing the time to create the SharePoint Search Center. As per the announcements of Intelligent Search, at Microsoft Ignite 2017 by Naomi Moneypenny, the same search box with the ability to search for people will now be accessible across all experiences. It is extremely common for IT to own the updates to profiles in Active Directory (60%). 26% respondents advised they didn’t know what the process was to update their profile information. Very few (12%) had integrations with other systems to keep AD up-to-date. This is usually because the system of record for profile information like Job Title, Department and Manager is not AD. For this reason, the most common systems to integrate with AD are Human Resource Management Systems (HRMS). The most popular integrated in the survey were ADP (13%), SAP (12%) and PeopleSoft (11%). Furthermore, it was extremely uncommon to have any sort of check of the accuracy of profile information with a small amount doing monthly (17%) and yearly (15%) checks. Tip: Sign up for Hyperfish Lite and let our service collect all those missing Office 365 profile photos from your users. In recent months, there has been more profile experiences adding the “Update my profile” buttons to drive people to the correct place. Many organizations lock down the ability to update profile information because there is no way to incorporate an approval for changes before they show up in profile cards. Hyperfish provides the ability to have profile information updates routed via the right approver before saving back to your directory. There is still a strong distribution of SharePoint Server 2013 (66%) and SharePoint Server 2010 (40%) deployments. In the 2016 Global Survey, SharePoint 2013 accounted for 65% of deployments and 2010 was 48%! This reduction in usage of the older version of SharePoint shows a healthy move towards supported versions of the platform. There is also healthy growth from 21% to 56% of respondents using SharePoint Online and 15% to 25% for SharePoint 2016. SharePoint is back and the modern sites are really enticing organizations to take advantage of the latest evergreen versions. With the focusing of the lens of SharePoint that I wrote about recently, it is surprising to see that Workflow (82%) is the most popular workload in SharePoint. 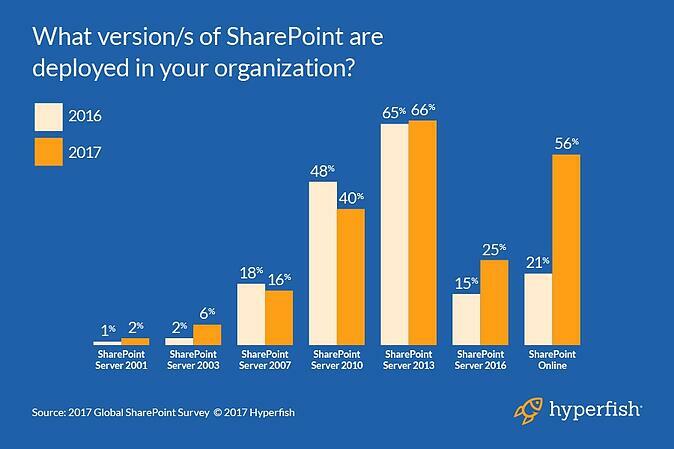 This is primarily because in SharePoint Server 2010/2013, workflow is a core workload and the majority of respondents are still on older versions of SharePoint. With the introduction of Microsoft Flow in Office 365, SharePoint Designer workflows have been all but deprecated. Workflow will still be a priority workload, but the focus won't be for SharePoint to design/host the business process. One thing to remember though is that in most cases, SharePoint will be the storage of inputs and outputs of the business processes. Tip: If you don’t already have a plan to get off of the unsupported versions of SharePoint Server (2001, 2003 and 2007), it’s time to start one! We appreciate everyone who took the time to fill out the survey this year. My predictions for next year is to see the legacy deployment number reduced by another 25% and Microsoft Teams usage to be up by 25%.